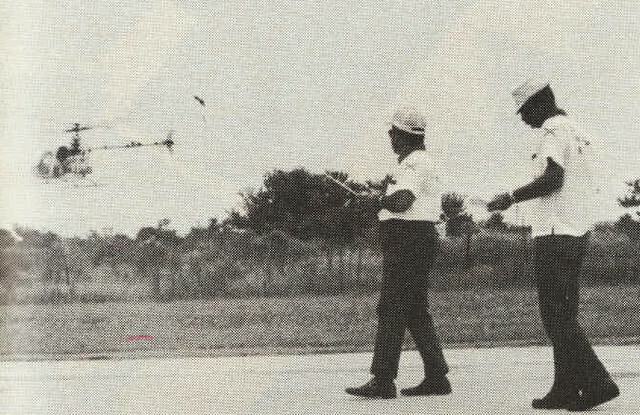 Not many years ago, the father of RC helicopters, Dave Schluter, developed a machine that was capable of little more than hovering maneuvers. Radio control helicopters have since developed into acrobatic machines, capable of loops, rolls and even unusual outside tumbles we'll call the outside loop. It was the acrobatic helicopter that dominated the 1978 AMA Helicopter NATS. The photographs included with the column do not do justice to the capabilities of the helicopter pilots attending this year's NATS at Sulphur, LA. Our arrival at the Lake Area Radio Kontrol Society's field on Saturday, July 20, found Bo Hinch, LARKS President and Assistant C.D., busily making last minute preparations to an already beautiful site. The field, complete with paved runway, sheltered work areas, air conditioned concession building and hobby shop, was an ideal site for the coming activities. The only drawback to the site location was that it was several miles from other NATS activities and, therefore, offered little opportunity for exchange between our interest group and other NATS activities. Sunday was a practice day for both helicopters and the fixed wing pattern ship. By Monday, July 31, the beginning of competition, there were but 22 contestants registered. The low registration was a popular subject since many of the contestants and observers felt that the late entry fee was excessive, totaling $55.00 for the Open contestant, and that registration and transmitter processing was cut off too early. Since that was the first NATS for helicopters as an official event, there was an element of unfamiliarity with AMA registration procedures, but complete information and an invitation for early registration and subsequent savings had been extended in the July issue of Model Aviation. While the helicopter event was a relatively small occasion, the total number of NATS entries dictates that pre-registration be emphasized for planning purposes. This was the year of the acrobatic helicopter. Heliboys, Revolution Rigid Rotors, and the prototype PBH Horizons dominated the Expert Class; only Mike Mas competed with a teetering head in that class. In addition, there was a definite trend toward non-scale machines. Only two entrants flew machines with a full fuselage, both Davan Jet Rangers - each placed. Bruce Buchanan and Jet Ranger were first place in Novice, and Ralph Burch flew his machine to a second in Intermediate. Scores were very close to the final round. In Junior Novice, Curtis Croker was first place flying a HB40PDP-powered Revolution 40 against John Benario's second place Heliboy. It was interesting to note that Curtis was also high score for Open Novice as well with 1623.3 against Bruce Buchanan's 1595, so we'll probably be hearing about this young man for some time to come. Equally impressive was John Benario's score of 1350, which could have netted him third place in Open Novice. John and his Heliboy had been flying less than a month prior to this meet. In Open Novice, John Buchanan and Jet Ranger teamed up for some very smooth hovering maneuvers and a first place. Steve Mintz and Peter Phillipp were second and third respectively; each flew with Heliboy. Intermediate class found the Heliboy in first place with John Clark. Second place was Ralph Burch and a Webra Speed powered Kavan Jet Ranger. Fifty points behind was George Croker, flying a standard Revolution 40 with HB40PDP engine. George proved the fixed pitch helicopter still has a life in competition against the collective machines. Things livened up a bit in Expert Class as acrobatics became the rule rather than the exception. A still camera cannot do justice to the maneuvers of which the rigid rotor machines are capable. Mike Mas flew his Revolution 40 with collective pitch, but a teetering head to second place against a field of rigid motor machines. The Revolution proved to be an excellent machine in Mike’s hands, but the K factors awarded for loops and rolls (K35) presented a handicap to his skills and the capabilities of the machine. This was a close second, as only points separated Mike from third place Bob Pinto. “O.C.” Bob Pinto was anything but “out of control” with that third place win. Bob and his Heliboy did some fantastic flying during and after the contest. No doubt you have heard, or will more, about this gentleman. Bob was recently overall winner at NRCHA Nationals. Probably the most unusual ability that Bob demonstrates is the capacity to fly almost any stick mode you put in his hands; single or two stick, nose or tail, has can fly it. Click on the image below to view some of the photos featured in this November 1978 Model Aviation article. Share your thoughts or comments below! Even 30 years ago sounds like pilots were doing extreme aerobatic moves with their heliopters. Thanks for sharing. Hi to all you RC'ers out there!!! Nice to see the artical on the "78" Nats Helio's, it brought back memorys! It was in the late 70's that I first got into Heliocopters, If I remember right, my first one was an American "Mantus" had wooden side frames, belt drive to the rear rotor, and I made a larger set of landing skids out of PVC pipe to help in learning to hover. I did get it off the ground!! My next Helio was a used "HelioBoy". It was a 60 sized machine. This is the one that I really learned to hover on. I rigged up a dowel stick and ball arangement strapped to the "skid" for practice, worked really well. The next machine was a "Gorham Cricket" 25 sized fixed pitch. Here's where I finally got into forward flight, and you really learned what "trottle" control was all about. The last heliocopter I bought was a "Hirobo Schuttle" It was orignally designed for a "OS Max" 25 size engine, and it was a little under powered, so "OS Max" brought out their "32"
sized engine, that made quite a difference!! I never got into any aerobatics, but really enjoyed nice forward flight big figure "8's" around the field. I was also "Chicken" to try any "Autorotations". Well I got deivorce in "1988" got out of RC, until I moved to Indiana in "2005" and joined the RC club here in town. I've always kept my AMA No. 42050 current since I joined AMA in "1976", second oldest No. in the club!! About a year ago, I got to hover one of the small electric sized helio's, and it really stirred up the juices. Looking into buying another heilo, but I can't decide if I want to go electric, or gas! I do have a "1978" OS Max 50FSR heliocpter engine new in the box, decisions, decisions??? I do fly a little fixed wing planes. But still miss the "Rotor Winged" stuff. Till later, "Keep the Blades Up" and the "Wheels Down"
We're glad that you and others are enjoying this article! We'll be sure to add more archived articles to the website. I remember that Nats very well! I was 15 trying to compete in Novice with a Revolution 40. Boy was it windy and hot! Bob Pinto blew all of us away with his Heli-Boy. I went on to fly a couple. Great machine while it held together. Still try to fly R/C Heli's once in a while. Vario Gasser, Trex 450 etc. But mostly fly my full size Cirrus SR22. Working on heli license. Boy were those the days!!!! My first venture at the AMA heli nats was at Westover AFB in 1983. It was amazing and I met so many people that were pioneers in the hobby including the late Ernie Huber flying a Horizon inverted for the first time I ever witnessed that they could do it. I met many people that are friends to this day. I currently fly only electrics due to health issues which keep me from glow fuel and over the past few New England winters have gotten into micro heli indoor flying. The sky is the limit.